﻿ Shale Property Rights » Blog Archive » Property Rights — Back! The ‘sleeper’ issue of shale gas extraction is waking up; and the energy industry is not happy to have sunlight detailing the adverse effects of eminent domain on private property rights. This is the form of eminent domain taking where government and energy companies join to seize private property rights (surface and/or subsurface) for gas/oil pipelines, compressor stations, underground nat gas storage reservoirs and more. I call it the third rail of eminent domain because, to date, even property rights advocates like the Institute for Justice (which helped take the Kelo case to the Supreme Court) decline to step up to natural resource development takings because, they tell me, of the “public use” interpretation of the courts. Not so at the grass roots level where there is increasing demand for change. 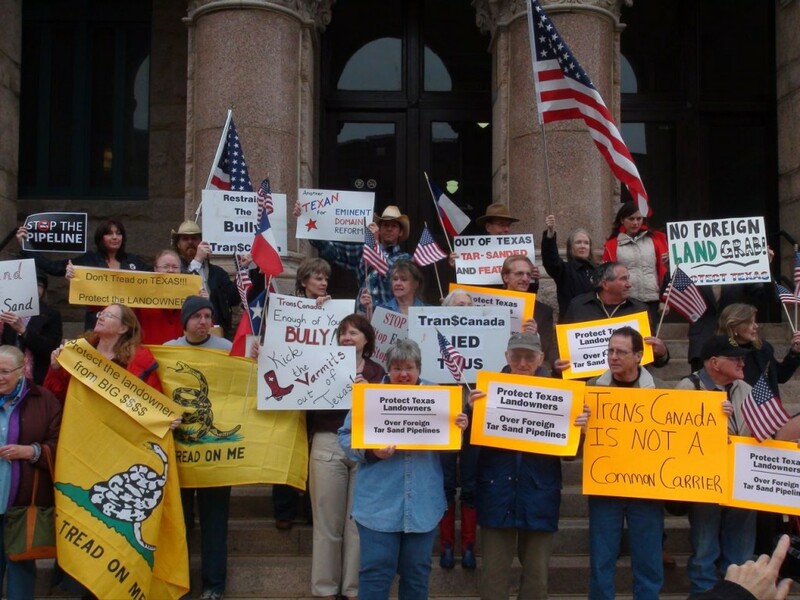 From Texas to New Jersey, citizens are challenging the domestic energy cartel comprised of government and industry. It is not stretching a point to say that eminent domain puts landowners in a face-off with the equivalent of a cartel comprised of energy companies and government, because the power of eminent domain allows corporations – backed by government – to control pricing and competition (i.e., “just compensation” and what constitutes “public interest”). By definition, that is a cartel. This is not remotely connected to free-market capitalism. Private property owners do not have much, if any, leverage when it comes to negotiating “just compensation” (the sound of laughter is coming from the energy companies). This profitable power of “taking” is why energy companies want “forced pooling” in Pennsylvania; and why New York State has “compulsory integration.” Texans who value their property rights must deal with “Rule 37,” another variation of eminent domain by which government regulators permit gas & oil companies to seize mineral rights from private property owners. Calvin Tillman, former mayor of DISH, Texas, told this writer that property rights abuse is what unifies the Coalition. These groups include: We Texans, Independent Texans, Texans for Accountable Government, and Texans Uniting for Reform and Freedom. DISH, Texas, is a small community that sits atop the Barnett Shale area, near Fort Worth. Tillman has 5 years of experience dealing with the energy industry and regulators as an elected official in DISH, including two terms as mayor.